We try to offer a separate teaser class at least every month. It is still possible to have a teaser class with a participation in a regular class. In case of interest: Registration through the general form. ⇒ start date not yet defined. First teaser lesson on 23-Apr-2019. ⇒ start date definitively on 30-Jan-2019. It's still possible to join the class. ⇒ Beginner stretching classes are currently filled well. On Friday 19:15 (with Pikun), it's easier to find a place. Monday 20:15 (with Kathrine) is currently difficult. But teaser lessons are always possible. All stretching classes are full, and spots in a beginner classes were especially in need, as that's where the path begins for all who start without good experience. So far all stretching classes were taught by Pikun. But time doesn't allow Pikun to teach additional stretching classes. In order to offer a solution for this bottleneck, We started to have stretching classes for beginners taught by other instructors, who have a special talent for this. Andrina's class runs for a while now. Now an additional class is added on Monday, taught by Kathrine. 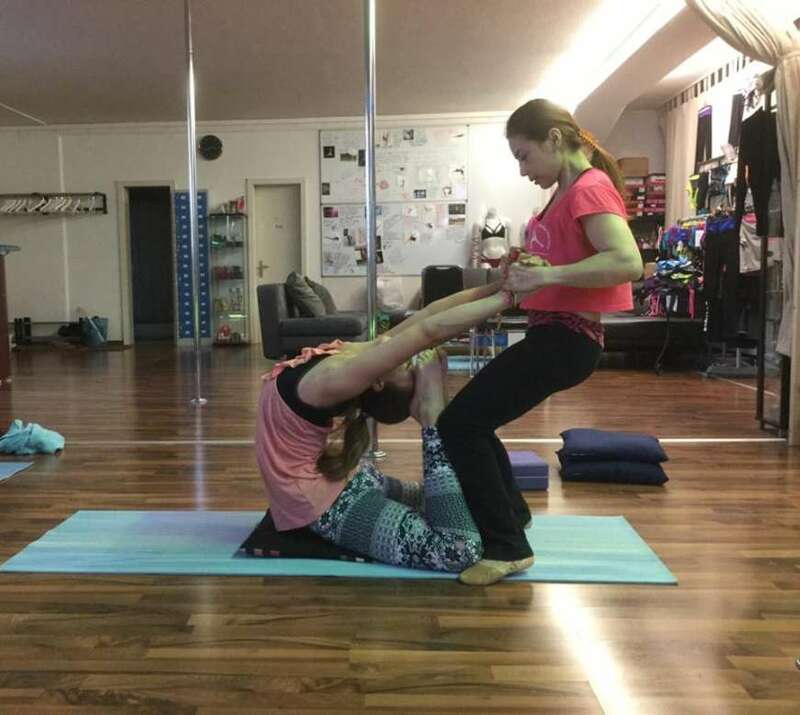 Kathrine is one of the very active stretching students of Pikun and she profited a lot from the style stretching is taught at Mystique Pole Dance. All this is not self-evident. Stretching classes at Mystique Pole Dance were always special and always will be. These are the only classes in the region, which build up based on the doctrine of contortion and deal with flexibility, but also the required core strength, balance and necessary concentration. Registration: The easiest is to register right here on this web page, otherwise as well by email or in Facebook.